Could your pet stand to shed a few pounds? If so, you’re not alone. More than half of the nation's dogs and cats are overweight, and one out of five is obese, according to the Association for Pet Obesity and Prevention -- and the obesity epidemic isn't showing signs of improvement. Pet obesity is on the rise for the sixth straight year, according to data released by Nationwide. Carting around those extra pounds can wreak havoc on your pet’s health, leaving you saddled with a mountain of vet bills. 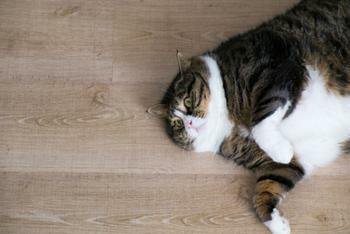 However, the health effects of pet obesity can be as devastating as they are costly. Dogs and cats who are overweight have an increased risk of health problems such as diabetes, high blood pressure, respiratory disease, kidney disease, and some forms of cancer. Because diseases like diabetes are far easier to prevent than to treat, experts recommend that pet parents do everything they can to make sure pets maintain a healthy weight. Pet parents can take action to help stave off obesity-related ailments -- such as canine arthritis, a disease that led to more than 49,000 pet insurance claims with Nationwide in 2015 alone -- by making sure their pets eat right and exercise. "Obesity can be detrimental to the livelihood of our pets," said Dr. Carol McConnell, vice president and chief veterinary medical officer for Nationwide, who says pet owners should be aware of both the quantity and quality of food and treats pets are given. Excessive weight can shorten an animal’s life expectancy by more than two years. But the beginning of a new year presents the perfect opportunity to create regular exercise routines for our pets and begin managing their eating habits, McConnell says. Monitoring your pet’s food and treat intake is key to preventing excessive weight gain. To begin monitoring your pet’s weight, McConnell recommends scheduling routine wellness exams with your vet -- especially if you’re starting to feel excessive fat over the ribs, spine, base of tail, neck, limbs, etc. Limit treats. Avoid feeding your pet too many fatty treats and table scraps as the calories in these snacks can add up. Choose quality food. In addition to regulating the amount of food and treats your pet consumes, make sure pets are fueling up with quality food. Incorporate exercise. Play time can bring physical and mental benefits for dogs and cats, so carve out time each day to exercise your pet. A round of fetch, a trip to the dog park, or a simple brisk walk can boost your dog's health. Indoor kitties can get exercise by chasing string toys or beams of light.